The first thing that Meredith Badger ever wanted to be was a writer and illustrator. Actually, the very first thing she wanted to be was a tight-rope walker because she wanted to wear a tutu and carry a parasol. But once she realised her balance wasn't all that great, she decided she'd like to make books instead. And this is exactly what she has done since her first published story appeared in DOLLY magazine at the age of 15. Today Meredith is the modest author of over 375,000 books sold across Australia and New Zealand. She is one of the main contributing authors of the phenomenal Go Girl! titles, a series which has now sold over 1.6 million copies across Australia and New Zealand since 2005. Her penned titles are a favourite with the young fans of the series and her popularity is reflected in her event appearances. Meredith was most recently mobbed while visiting schools in the highly publicised Books Alive 2008 campaign. 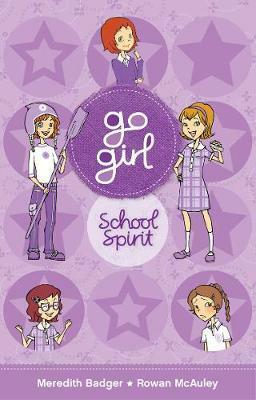 This ability to connect with the real girls of today is something that Meredith takes pride in "Writing a Go Girl! often involves delving back into distant schoolyard memories. Sometimes they are funny in hindsight, sometimes they are still embarrassing or painful! Lots of things have changed since I was at school, but the fundamentals are still the same - friendship, siblings, sport, school, and the ups and downs of life as a pre-teen." Her most recently completed book - Tweenie Genie: Genie in Training - aims to `debunk the myths' surrounding genies. Poppy discovers on her twelfth birthday that she is not as ordinary as she had always presumed. She is actually a genie, and is expected to start behaving like one straight away! Meredith divides her time between working in new media, writing, and eaves-dropping on kids when she's in her local South Melbourne park with her three-year-old daughter. Rowan McAuley lives in Sydney, and has pretty much always done so. She has studied English Literature, Mandarin, counselling, and sculpture, and reads a lot of children's books. Her favourites are: C. S. Lewis, Roald Dahl, and Lewis Carroll. Rowan is responsible for writing some of the most successful and memorable stories and characters in the best-selling Go Girl! series. She loves reading and writing, because stories can take you out of your everyday life and put you right inside the feelings and experience of another person.